Mayo Clinic's social media journey began in 2005, after a team retreat at which a guest speaker described some varieties of what we then called "new media." One that seemed particularly interesting and relevant to us was podcasting, which is a way of enabling consumers to subscribe to a series of related audio or video files. As we discussed creating podcasts, it was hard to justify using a lot of resources for something that seemed so speculative. At the time, August 2005, podcasting had really only been done seriously for about 11 months. But Apple had just added a podcast directory to what was then called the iTunes Music Store, and so it seemed likely to become a more mainstream activity. Creating an RSS feed that would enable consumers to subscribe. 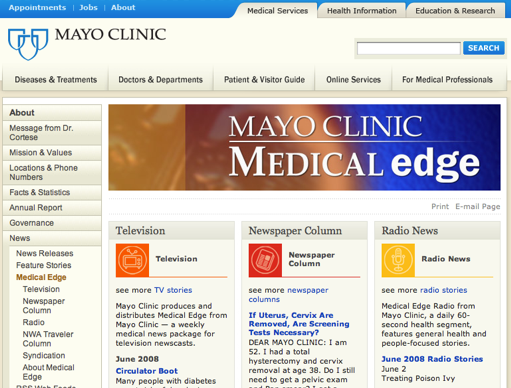 For Mayo Clinic, the first problem was solved fairly easily: we already had some mp3 files on our MayoClinic.org Web site, from our daily radio program called Mayo Clinic Medical Edge. The second part, creating the RSS feed, was more complicated, but a programmer on our MayoClinic.org team said she thought she could figure it out. That's where the title of this post comes in, or as some would put it, "It's better to ask for forgiveness instead of permission." In early September 2005 my programmer colleague, Mindi, finished writing a little routine to create RSS feeds, and we used it to quietly list the Mayo Clinic Medical Edge radio podcast in iTunes. The podcast was featured on the front page of iTunes, rotating among a few other "early adopters." And we saw the downloads of mp3 files from MayoClinic.org increase by about 8,200 percent in October, as compared with August, the last full month before our podcast program became active. While this is a classic case of the standard disclaimer, "your mileage may vary," here are two major points organizations, particularly those in health care, should consider when contemplating starting a social media program. Progress depends on taking calculated risks. It's good to do what you can, within reason, to minimize the likelihood of a major problem. In the case of our first podcast, we were taking audio files that were already available on the Web, and just enabling people to subscribe instead of having to navigate to our site each week for the new segments. We weren't editing the underlying content. Risks are unavoidable. It's not just starting new programs that can potentially cause problems.Not acting also involves risks. Risks are unavoidable - even in social media. Here's an interesting take on the advantages of being an early adopter. Here's an early history of the Mayo Clinic podcast authored by the one and only Lee Aase. Another fundamental rule of social media management - It's better to ask for forgiveness instead of permission. Is your organization planning to revamp its social media program? Remember that progress depends on taking calculated risks.